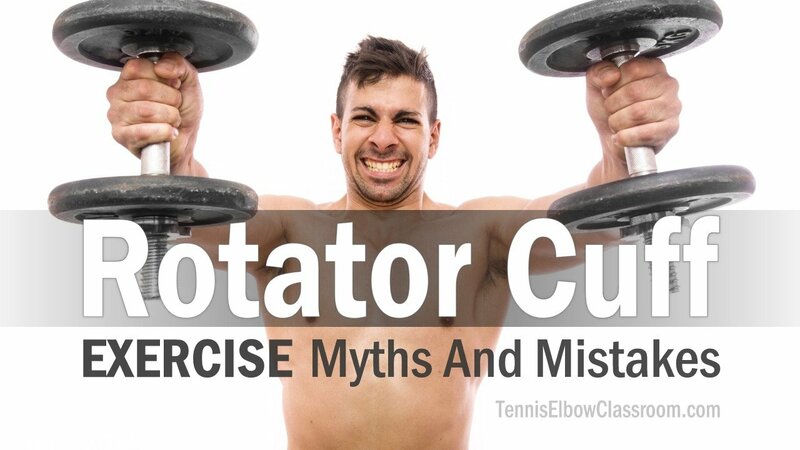 Rotator Cuff Exercises are essential – But avoid making these mistakes! The four muscles and their tendons that make up the Rotator Cuff of the shoulder are, probably, the most misunderstood, taken for granted AND frequently injured muscles in the body. This is an essential, if not critical, area of importance for Tennis Elbow and Golfer’s Elbow sufferers, too! Which is why I’m writing about it here. In the video below, Jeff Cavaliere, a Physical Therapist for pro athletes, describes the function of the four muscles of the Rotator Cuff, dispelling several myths he runs into about them and offers excellent suggestions on avoiding several mistakes when it comes to exercising the Rotator Cuff. His message seems to be mainly directed at athletes, who do a lot of weight training, but it has some key points I want to discuss and elaborate on in the rest of this article. Jeff Cavaliere, of Athlean-X, P.T. for pro athletes, describes the function of the 4 Rotator Cuff muscles and dispels some of the most common myths (five) he has encountered around them. Clearly, these muscles have a function when it comes to rotating the shoulder joint internally and externally, (forward and backward) hence the name. The Primary Function Of The Cuff Is NOT Movement! The shoulder is the most mobile joint in the body, having the largest range of motion (ROM) which makes this joint the most vulnerable to injury. One of the points Jeff makes in the video is that, in his experience working with athletes, most of their weight training is devoid of Rotator-Cuff-specific exercises. And when I DO observe people doing these exercises, they are, more often than not, doing them incorrectly – Dangerously, even! 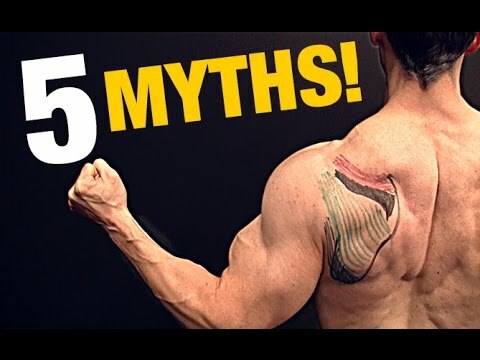 I’m not going to cover all of Jeff’s 5 myths here, but from my perspective, the most important point covered, is the risk involved in an exercise that is often suggested for the Supraspinatus muscle. One forces and keeps ones shoulders in an internally rotated position (rotated forward – instead of neutral or allowing external rotation) as one abducts / raises ones arms out to the side. AND ones wrists pronated (hands turned palms down, thumbs pointed toward the floor) as if one was holding a bottle or can that one was pouring out. And, subsequently, increasing the potential compression and friction on the tendon and the risk of wear and tear on it. The Supraspinatus is the most vulnerable muscle and tendon of the Rotator Cuff – and shoulder, in general, and the most frequently injured. It is the tendon that gets affected by Bursitis and gets ‘impinged’ – And it’s the most common site of tendon degeneration and fraying/tearing. And the Supraspinatus, unfortunately, claims the dubious distinction as the site of the second-most-common Orthopedic procedure in the US, following arthroscopic repair of the knee. Jeff, demonstrates a much safer exercise in the video, known as ‘Scaption’ to work the Supraspinatus, which is a mix of shoulder abduction and flexion, with the weights held in a neutral wrist position (thumbs pointed up) and NO internal shoulder rotation. I will point out that there is another exercise for the Supraspinatus, one can do if one has access to cable equipment at a gym or at home. Because this is not an ideal exercise to do with bands, which are often used by trainers and therapists to demonstrate Rotator Cuff exercises and recommended to clients and patients as an easy way to do them at home. The amount of resistance bands provide, changes as one moves through the exercise’s range of motion – beginning with less and increasing as one executes the motion. This is okay for training some muscles, but I believe the tendons of the Rotator Cuff Muscles, in particular, benefit from a constant, steady resistance. Building coordination through SLOW, consistent resistance throughout the range of motion is key. Lastly, I have a disagreement with Jeff (or a partial disagreement, anyway) over his second myth, the idea that one needs to train the entire Rotator Cuff. Do You Need To Train The Whole Cuff – Or Not? This may be applicable to athletes who are training every major muscle in their upper bodies, utilizing multiple exercises. The “lats” (Latissimus Dorsi) and to a lessor extent, the “pecs” Pectoralis Major (not to mention the Teres Major) are internal rotators themselves. And perhaps it does make sense for this subset of people (whom Jeff is primarily speaking to) to skip working the Subscapularis directly and instead let it get worked by way of those other movements/exercises. Hitting the “Subscap” with multiple sets and using ever heavier weight / greater resistance? Probably not necessary for most people. It doesn’t necessarily need to get a lot stronger in some people – but it does need to remain functional and coordinated. Some targeted exercise in order to condition and strengthen the Subscapularis tendon and avoid dysfunction has to be a good idea! Especially for people who need maximum shoulder coordination, strength and flexibility. Rotator Cuff dysfunctions are notoriously common in this group, including degeneration, fraying, bursitis, (which affects/involves the Supraspinatus) impingement and tearing. Not to mention that insidious, chronic degeneration is all-too-common in the aging population at large.